•(b) you must not reproduce, duplicate, copy, sell, resell, visit, or otherwise exploit our website or material on our website for a commercial purpose, without our express written consent. •(c) you must not edit or otherwise modify any material on the website. Our liability is limited and excluded to the maximum extent permitted under applicable law. We will not be liable for any direct, indirect or consequential loss or damage arising under this disclaimer or in connection with our website, whether arising in tort, contract, or otherwise . including, without limitation, any loss of profit, contracts, business, goodwill, data, income, revenue or anticipated savings. This notice will be governed by and construed in accordance with New Mexico law, and any disputes relating to this notice shall be subject to the exclusive jurisdiction of the courts of Albuquerque, New Mexico. The full name of our company is blank and our address is 10555 blank Blvd Ste 80 NM 87111. You can contact us by email or phone at 1-888-444-1111. This license shall automatically terminate if you violate any of these restrictions and may be terminated by Shane Zentz at any time. Upon terminating your viewing of these materials or upon the termination of this license, you must destroy any downloaded materials in your possession whether in electronic or printed format. The materials on Shane Zentz’s web site are provided “as is”. Shane Zentz makes no warranties, expressed or implied, and hereby disclaims and negates all other warranties, including without limitation, implied warranties or conditions of merchantability, fitness for a particular purpose, or non-infringement of intellectual property or other violation of rights. Further, Shane Zentz does not warrant or make any representations concerning the accuracy, likely results, or reliability of the use of the materials on its Internet web site or otherwise relating to such materials or on any sites linked to this site. In no event shall Shane Zentz or its suppliers be liable for any damages (including, without limitation, damages for loss of data or profit, or due to business interruption,) arising out of the use or inability to use the materials on Shane Zentz’s Internet site, even if Shane Zentz or a Shane Zentz authorized representative has been notified orally or in writing of the possibility of such damage. Because some jurisdictions do not allow limitations on implied warranties, or limitations of liability for consequential or incidental damages, these limitations may not apply to you. The materials appearing on Shane Zentz’s web site could include technical, typographical, or photographic errors. Shane Zentz does not warrant that any of the materials on its web site are accurate, complete, or current. Shane Zentz may make changes to the materials contained on its web site at any time without notice. Shane Zentz does not, however, make any commitment to update the materials. Shane Zentz has not reviewed all of the sites linked to its Internet web site and is not responsible for the contents of any such linked site. The inclusion of any link does not imply endorsement by Shane Zentz of the site. Use of any such linked web site is at the user’s own risk. Any claim relating to Shane Zentz’s web site shall be governed by the laws of the State of Indiana without regard to its conflict of law provisions. This license shall automatically terminate if you violate any of these restrictions and may be terminated by shanezentz.com at any time. Upon terminating your viewing of these materials or upon the termination of this license, you must destroy any downloaded materials in your possession whether in electronic or printed format. The materials on shanezentz.com’s web site are provided “as is”. shanezentz.com makes no warranties, expressed or implied, and hereby disclaims and negates all other warranties, including without limitation, implied warranties or conditions of merchantability, fitness for a particular purpose, or non-infringement of intellectual property or other violation of rights. Further, shanezentz.com does not warrant or make any representations concerning the accuracy, likely results, or reliability of the use of the materials on its Internet web site or otherwise relating to such materials or on any sites linked to this site. In no event shall shanezentz.com or its suppliers be liable for any damages (including, without limitation, damages for loss of data or profit, or due to business interruption,) arising out of the use or inability to use the materials on shanezentz.com’s Internet site, even if shanezentz.com or a shanezentz.com authorized representative has been notified orally or in writing of the possibility of such damage. Because some jurisdictions do not allow limitations on implied warranties, or limitations of liability for consequential or incidental damages, these limitations may not apply to you. The materials appearing on shanezentz.com’s web site could include technical, typographical, or photographic errors. shanezentz.com does not warrant that any of the materials on its web site are accurate, complete, or current. shanezentz.com may make changes to the materials contained on its web site at any time without notice. shanezentz.com does not, however, make any commitment to update the materials. shanezentz.com has not reviewed all of the sites linked to its Internet web site and is not responsible for the contents of any such linked site. The inclusion of any link does not imply endorsement by shanezentz.com of the site. Use of any such linked web site is at the user’s own risk. Any claim relating to shanezentz.com’s web site shall be governed by the laws of the State of Florida without regard to its conflict of law provisions. Your access to and use of Shane Zentz is subject exclusively to these Terms and Conditions. You will not use the Website for any purpose that is unlawful or prohibited by these Terms and Conditions. By using the Website you are fully accepting the terms, conditions and disclaimers contained in this notice. If you do not accept these Terms and Conditions you must immediately stop using the Website. Shane Zentz will never ask for Credit Card details and request that you do not enter it on any of the forms on Shane Zentz. The contents of Shane Zentz website do not constitute advice and should not be relied upon in making or refraining from making, any decision. 4.1 change or remove (temporarily or permanently) the Website or any part of it without notice and you confirm that Shane Zentz shall not be liable to you for any such change or removal and. 4.3 change the timezone data used by this website for any purpose as seen fit to conduct standard business. 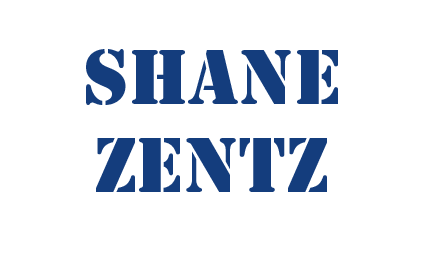 Shane Zentz Website may include links to third party websites that are controlled and maintained by others. Any link to other websites is not an endorsement of such websites and you acknowledge and agree that we are not responsible for the content or availability of any such sites. 6.1 All copyright, trade marks and all other intellectual property rights in the Website and its content (including without limitation the Website design, text, graphics and all software and source codes connected with the Website) are owned by or licensed to Shane Zentz or otherwise used by Shane Zentz as permitted by law. 7.2 To the extent permitted by law, Shane Zentz will not be liable for any indirect or consequential loss or damage whatever (including without limitation loss of business, opportunity, data, profits) arising out of or in connection with the use of the Website. 7.3 Shane Zentz makes no warranty that the functionality of the Website will be uninterrupted or error free, that defects will be corrected or that the Website or the server that makes it available are free of viruses or anything else which may be harmful or destructive. 7.4 Nothing in these Terms and Conditions shall be construed so as to exclude or limit the liability of Shane Zentz for death or personal injury as a result of the negligence of Shane Zentz or that of its employees or agents. 7.5 Are you really reading this crap? You agree to indemnify and hold Shane Zentz and its employees and agents harmless from and against all liabilities, legal fees, damages, losses, costs and other expenses in relation to any claims or actions brought against Shane Zentz arising out of any breach by you of these Terms and Conditions or other liabilities arising out of your use of this Website. These terms and conditions are based on an SEQ Legal template available at www.website-law.co.uk. Premium SEQ Legal precedents include template contracts of supply. [We subscribe to the following code[s] of conduct: [CODE(S) OF CONDUCT]. [These codes/this code] can be consulted electronically at https://www.shanezentz.com/shane_zentz_terms.php . The full name of our company is Shane Zentz. Our [registered] address is [Nowheres]. You can contact us by email to webmaster@shanezentz.com .